As a long time homeowner and interior stylist, I'm passionate about decorating homes in a way that makes the owner feel happy and relaxed and that also doesn't break the bank. There's absolutely no need to spend a fortune on any interior item - the key is to work out your core style, become confident with that style and spend money only on items that suit your core style. This discovery of your core style is usually a journey involving trial and error, but more importantly, it's about developing an awareness of what really makes your heart sing and why. What's your core style - a perfect example of eclectic interior style here at Artist Residence, London, with some kickass art on the walls too. I'm not an art expert by any means (I got halfway through an Open University Art History degree before abandoning it to have children) but exactly the same rule applies to buying art in my opinion - buy what makes your heart sing. In recent years the availability online of posters and prints has gone through the roof and, at the same time, the trend for gallery walls has really taken off with people buying prints galore to add to their gallery walls. And those gallery walls are getting bigger and bigger - growing as far and as fast as the homeowners confidence grows in their own style. Go as big and bold with your gallery wall as your core style allows. Propping art against the wall and displaying sculpture on the floor? That's fine too! But did you know that for the same price as many posters and prints you can buy a piece of original or limited edition art? In recent years the Affordable Art Fair has been bringing art to a far wider audience at their regular art fairs held around the world. The fairs are beautifully curated and displayed and are a visual feast for the eyes. If you're feeling a little overwhelmed by the choice, there's plenty of friendly help available from AAF staff and gallery owners. The price range of the art on offer is wide but there are many pieces for under £500 and under £250. The Affordable Art Fair asked me to come along to their London Hampstead fair last week and choose some art for £250. Here's a couple of the many pieces that jumped out at me while I was browsing around the beautiful marquee. Hanging Around 1 - Victoria Heald. Oil and Acrylic on board. 61cm x 61cm.I love how this ordinary, casually dressed person is suspended against a glamorous gold backdrop. After Modigliani by Hock Tee Tan. Chinese Ink and Oil Pastel. 80cm x 110cm. After much browsing and debate, I chose two pieces of limited edition art with my £250 voucher. Lips by Andrew J Millar. 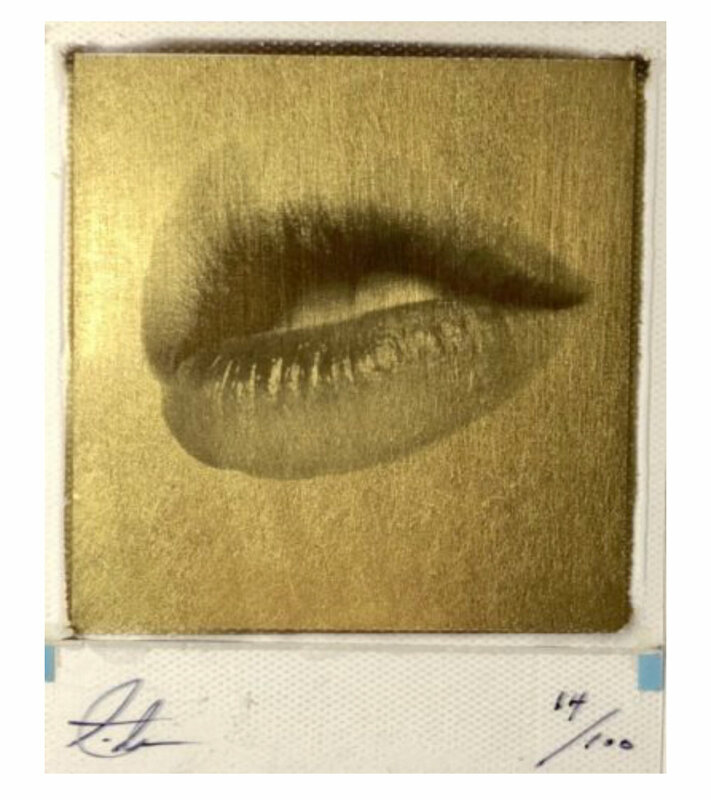 24 carat gold leaf on Polaroid. I chose this limited edition by Andrew Millar partly because I have always loved collage and I've never before seen the effect he's achieved with gold leaf and Polaroid. Detox III - Marcelina Amelia. 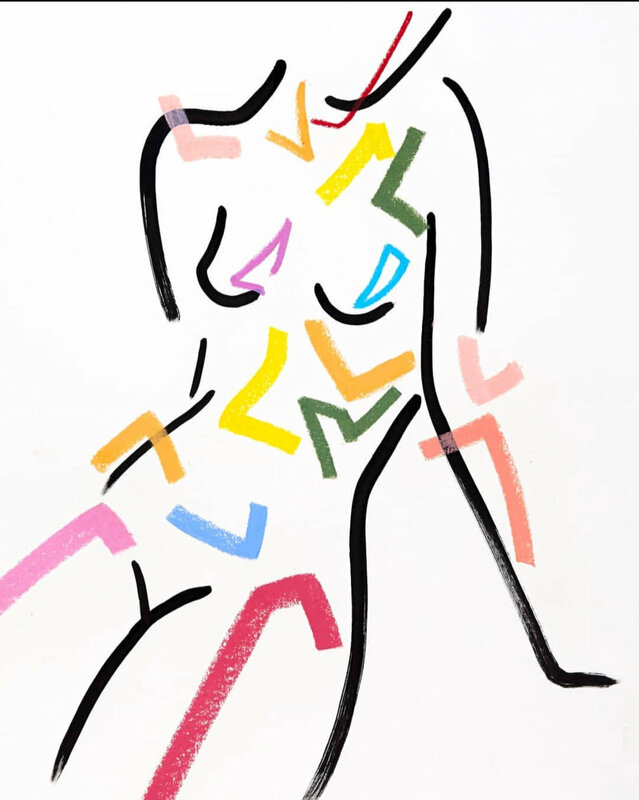 I chose this Marcelina Amelia limited edition partly for it's simple but bold lines and the enigmatic half face. 'You are the most qualified person to decide what art goes into your home. It's up to you to decide if you are interested in the idea or not - that's what makes buying art so subjective because we're all interested in different things. When that idea connects with you it's like magic and it creates a little spark. Every time you look at the artwork, the connection will recharge and you'll know that it holds within it someone's personal message that you received in your own way'. Because of this I already know that I'll love and treasure these pieces for longer than if they were just prints. And they didn't cost much more than a print. The chosen pieces in my home. The Marcelina Amelia piece needs framing! Another beauty of the Affordable Art Fair is that you can now buy the art that's shown at the fairs all year round on the Affordable Art Fair website shop . There are over 6000 pieces available from the shop and you can filter your search in any way - by price, colour, genre to name but a few. I heartily recommend an undisturbed romp around the website to see what catches your eye and resonates with you. Read the story behind the art. I've made a start for you with my Top Ten Edit. In the unlikely event that you don't like the art you've chosen once it's in situ, the Affordable Art Fair offers a 14 day free returns policy. I really loved my insight into the Affordable Art Fair. I think it's briliiant that both established and emerging artists have this platform to grow from, and that people now have easy access to all sorts of art whatever their budget or interior style. This blog post was sponsored by AAF but as always, all opinions are my own.